I gifted this to my daughter. She is a great fan of such comics and heroic characters. Its quality made me feel to buy one for myself . But overall, everything is good. Delivery, price, color. Good work FJ. Though I saw the movie many times but never got a chance to own one from the movie. 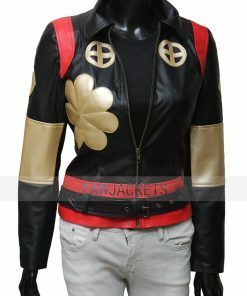 But when I saw this jacket with such price, I could not stop myself ordering it. I received it within a week, good service Fan jackets. All the female fan of Suicide Squad, here is a beautiful piece of clothing exclusively for you. The Suicide Squad Katana Jacket has beautiful designs of the Japanese culture to resemble the one worn in the movie. It is made of PU leather, which is durable. It has a zipping style for the front closure and two pockets. This stunning Katana Suicide Squad Jacket will give you the perfect appearance of the samurai assassin.Try this masterpiece in the happy evenings with friends or refreshing mornings at the campus. Order now and get it delivered fast and free!